Ostia Antica – If you would like a day away from the bustle of the city, how about a stroll under the pine trees, along Roman roads, through a long-deserted town half an hour’s train ride from the city? The fabulous site of Ostia Antica was once the hub of Rome’s trade links with the rest of the world. Massively under-visited, it makes for a great alternative to Pompeii if you are interested in seeing what’s left of a functioning Roman town. Unlike Pompeii, Ostia was not the victim of a fearsome natural disaster; if your heart is set on volcanoes, you’ll have to journey south. (For a painless day trip to Pompeii, look into Enjoy Rome’s Pompeii Shuttle, see below). Ostia’s name comes from the Latin ostium meaning ‘mouth’ because its position was once the mouth of the Tiber. However the deposits of sediment left by the river saw it gradually change its course until Ostia was left, quite literally, high and dry. The town was abandoned, buried by centuries of sediment until the original roads were excavated from the 19th century. Relics of the port’s vibrant business life can be seen in the Forum of the Corporations, where mosaic floors indicate where the shipbrokers, ivory traders, and fish merchants hawked their wares. The theatre was where Ostians sought entertainment, and the numerous religious buildings are a reminder that Ancient Ostia was a multi-cultural mix of people from the farthest reaches of the Empire. There is a synagogue, several mithrea (religious buildings dedicated to the mysterious bull-slaughtering all-male cult of Mithras), temples dedicated to Egyptian deities, as well as the staples of the Roman religious world – the Capitoline triad of Jupiter, Juno, and Minerva. 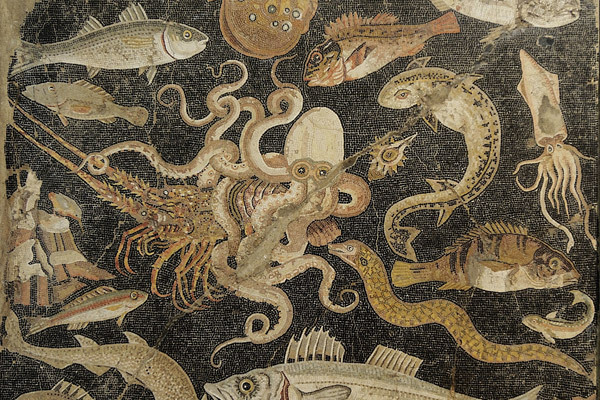 As well as the buildings of state, Ostia also gives a view of more everyday life with apartment buildings, a fishmonger, a tavern, and even a public lavatory. How to get there: From Piramide (metro line B) leave the metro station and go in the adjoining station (on your left) of the suburban line Ferrovia Roma-Ostia Lido. The line is included in the Rome city transport system so you can use either your 75 minute €1,50 ticket or a city travel pass. Get off at Ostia Antica, the last stop. The end of the line is Ostia Lido, Rome’s seaside suburb. Tivoli – 25 miles east of the city, the Via Tiburtina leads to the ancient city of Tibur, modern Tivoli. The town’s charming medieval centre has been rather swamped by the post-war fascination for reinforced concrete, but it is distinguished by being home to not one but two UNESCO World Heritage Sites. Once accessible from Rome along the River Aniene, the area was favored by the movers and shakers of Ancient Rome for their country houses including the Emperor Hadrian. Just out of the town centre (take the bus from the central square, Piazza Garibaldi) is Hadrian’s Villa (Villa Adriana) (9am-7pm in summer, otherwise 9am-sunset, entrance closes 90 mins earlier. €8/€4). This vast complex of pavilions and courtyards set in gardens and all served by a complex maze of underground tunnels was the country retreat of the Emperor Hadrian. An enthusiastic scholar of architecture, he is sometimes thought to have designed many of the buildings himself, and work was carried out over much of his twenty-year reign. After climbing the slope from the entrance, a small building houses a model of how it once looked, before centuries of treasure hunters pillaged the complex. Alternatively take Enjoy Rome’s 7-hours “Tivoli Day Trip Tour – Villa d’Este & Hadrian’s Villa” covers the visit of Hadrian’s Villa and Villa d’Este in Tivoli. Once the rural retreat for the elite during the Empire, Tivoli was about to become so again during the Renaissance. In the 16th century, Pirro Ligorio (a scholar of Hadrian’s Villa) was brought in to design the Villa d’Este (Piazza Trento, just off the central piazza. €6.50, €3.25) and its gardens for his flamboyant patron, Cardinal Ippolyte d’Este. The house has beautiful bucolic fresco decorations, but the undoubted draw is the steep garden with its magical fountains. How to get there: Take the Metro B to Ponte Mammolo, and take the COTRAL bus service. Those marked autostrada or A24 are faster. Most services stop at Villa Adriana, ask the driver. 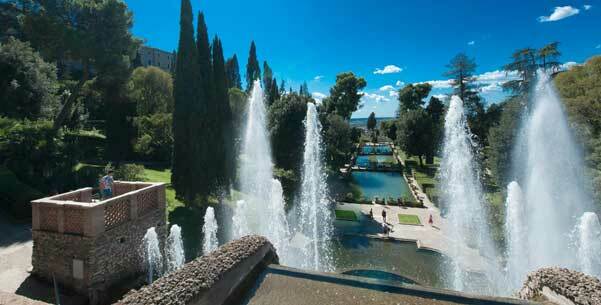 If not get off at the central piazza in Tivoli, Piazza Garibaldi, and take a 10 minute bus to Villa Adriana. For the Villa d’Este, get off at Piazza Garibaldi. Cerveteri – If you are interested in the Etruscans, take a trip to Cerveteri, ancient Caere. One of the major Etruscan cities, it once boasted 3 ports on the nearby coast. In the town itself the 16th century Orsini castle houses the Museo Cerite with some of the finds from the area (although the best pieces are mostly in the Etruscan museum at villa Giulia in Rome). A half-hour walk out of town is the Necropolis of the Banditaccia where you can let out your inner Indiana Jones and explore tombs from the 7th to the 3rd centuries. How to get there: Either take the COTRAL bus service from Cornelia (Metro A) along the Via Aurelia, or take the FR5 train from Stazione Ostiense or Stazione Trastevere to Marina di Cerveteri, and from there take a bus to Cerveteri. Florence – The birthplace of Dante and Michelangelo, home of the Medici, cradle of the Italian Renaissance, and site of the Bonfire of the Vanities, Florence is an easy hour and a half train ride from Rome. Try and do it all in a day and you’ll explode, but pick a couple of sights, have a wander, and maybe even fit in a spot for lunch and it’s a great day trip. Here are a few suggestions: visit the Duomo; climb the bell-tower; see the Baptistery; climb to the Piazza Michelangelo and then to San Miniato for a view across the city; visit Michelangelo’s tomb, see the Pazzi Chapel, and admire the frescoes in the refectory at Santa Croce; visit the Uffizi; go to the Brancacci Chapel at Santa Maria del Carmine; admire Santo Spirito; look at Masaccio’s crucifixion at Santa Maria Novella; see the David at the Accademia; walk across the Ponte Vecchio; visit the Medici chapels at San Lorenzo; get lost in the Oltrarno. How to get there: Take the Eurostar Freccia Rossa from Termini to Firenze Santa Maria Novella, the journey takes about 1 hour 35 minutes and costs €44 each way. Pompeii - For a day trip to the ruins of the city which was snuffed out by the eruption in August of 79 A.D. of Mount Vesuvius take the train to Naples Central Station (Piazza Garibaldi). At the station follow signs for the Circumvesuviana local railway, and take it to ‘Pompei Scavi ‘ (NOT ‘Pompei’). DO be especially careful of your belongings in Naples station and on the trains. The fast train (Freccia Rossa) to Naples takes 1 hour and 10 minutes, and costs €44 one way. The Eurostar takes 1 hour and 45 minutes, and costs €34 one way. From Naples Centrale to Pompei Scavi on the Circumvesuviana takes about half an hour. 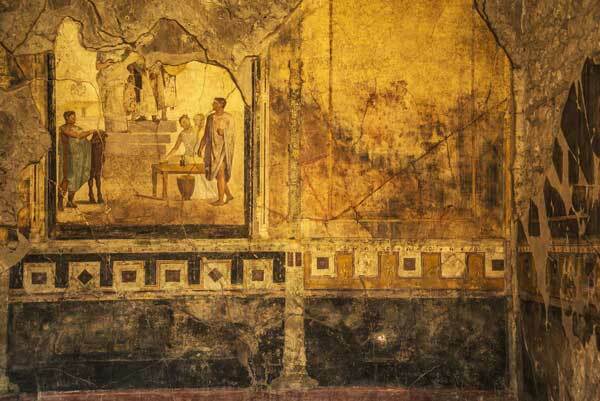 Alternatively Enjoy Rome runs a Pompeii Shuttle Day Trip Tour. The air-conditioned coach leaves our office on Tuesdays and Fridays from 1st April- 31st October at 7.30 am, arriving at the excavation site at Pompeii at around 10.45 am. You are then free to explore the site (you can pick up a guided tour at the entrance if you wish) until 3.30pm when the bus whisks you back to Rome, arriving at the Enjoy Rome office at about 7pm. The shuttle costs €68, €58 for under-26, making it both cheaper and easier than the train; what more could you possibly wish for? Reggia di Caserta – Closed Tuesdays. Part way between Rome and Pompeii, the unlovely city of Caserta is home to the splendid Reggia, the 18th century Palace of the Bourbon dynasty who once ruled Naples. A UNESCO World Heritage Site, the palace boasts splendid apartments, as well as spectacular gardens and an enormous park through which you can take a horse-drawn carriage ride. 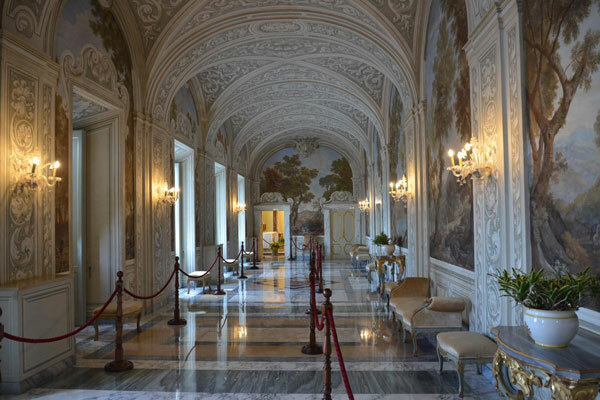 The palace was the site of some of the interior scenes set in the Vatican Palace in the movie Angels and Demons. Beaches within striking distance of Rome. It isn’t the glittering Med as seen in movies, but if you fancy a day off sightseeing, a dip, and maybe a place of spaghetti alle vongole, the beaches near Rome hit the spot. Bear in mind that the further away from the city you get, the cleaner the water. The closest, if not the nicest, beaches are at Ostia Lido where there are a number of stabilimenti which will rent you a sun lounger, and or umbrella. From Ostia Lido alternatively take the number 7 bus along the coast road south to the cancelli (literally ‘gates’), these are the free council-owned beaches. Continuing along the coast road past the cancelli, there are a number of restaurants which rent out sun loungers. Sperlonga – A pretty whitewashed medieval town overlooking two main beaches, Sperlonga is worth the journey, and the water’s the cleanest you’ll find in striking distance of Rome. Santa Marinella - 60 kilometres northwest of Rome, on the Via Aurelia, Santa Marinella is a pleasant seaside town close to the ancient Etruscan port of Pyrgi (modern day Santa Severa). If the big city is getting a bit much come here to have a dip and eat some fish. How to get there: Trains regularly leave from Roma Termini, Ostiense, Trastevere, and San Pietro, take about an hour, and cost €4.10.